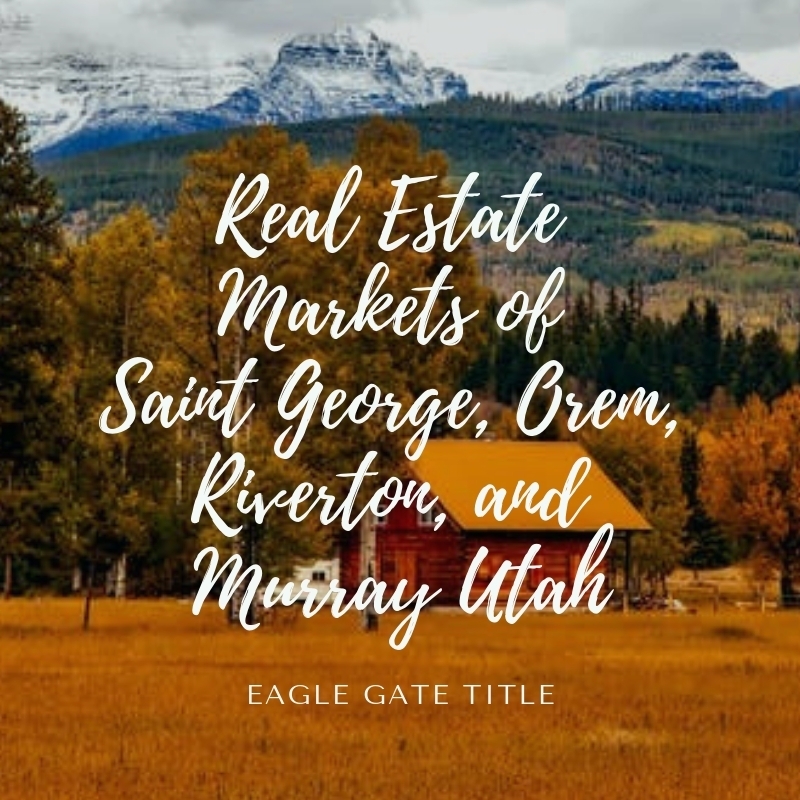 The real estate markets of Saint George, Orem, Riverton, and Murray vary slightly because of climate, room for urban and suburban sprawl, and factors of economy. Having recovered from the burst real estate bubble of 2008, Utah housing is strong again, especially in areas of rapid population growth. For example, the formerly quiet, little town of Saint George, Utah is now widely considered the nation’s fastest growing metropolitan area in the USA. The roughly 100,000 residents will likely burgeon toward 200,000 in the next several years, especially during the winters when mild temperatures beckon to the snowbirds and visitors. Washington County’s rustic beauty and warm winter climate continue to attract people from all states and Mexico. The St. George Municipal Airport, opened in 2012, has improved access to business travelers, and companies are building in Washington County, partly because of the abundance of good, young workers. Dixie State University adds culture, people, and education to this desert oasis, as well as plenty of ambitious and good-natured young people for companies to employ. St. George’s surrounding acreage of frontier provides plenty of space for developers to build new housing communities and industrial parks. Beginning with the real estate trends of Saint George, there was little change in house prices from June to July of 2018. The median list price is just under $400,000, and the price per square foot is about $171, which is a small increase from the previous two months. The inventory of homes for sale stands at 135. The ratio of foreclosures and short sales to the total real estate market in St. George did not change. In Orem, Utah, the median price for a house is $449,000, which dropped about 5% from June 2018. The number of houses for resale in Orem is 163. This is slightly higher than in June. Per square foot, the price of a home in Orem is the same in June and July: $131. The percentage of distressed properties to total houses for sale stayed the same in June and July. The real estate market of Orem, Utah has been quite stable in the last several years. Riverton saw a small increase in list prices of homes from June to July 2018 by 4% to about $510,000. The inventory for home resale in Riverton is 59, and $140 is the median price per square foot, which was the same in June. The number of homes for sale in Murray, Utah in July 2018 is 71, and their median list price is just under $350,000. The list price per square foot is $172, down from the June price of $166. Utah is known for its fiscal responsibility and low unemployment rate, which is commonly the lowest of the 50 states. If Utah’s government continues to apply sound legislation to support economic growth, public education, and conservation of natural resources, the real estate markets of cities like Saint George, Orem, Riverton, and Murray, Utah should see only minor fluctuations in market statistics to enjoy some stability and modest appreciation in house values. Utah in general is seeing some of the fastest population growth in the country, though some areas like Uintah County are shrinking. Pam Perlich, director of demographics at the University of Utah’s Kem C. Gardner Policy Institute said that some of the population of the declining rural counties of Utah is probably moving into the urban core that is doing quite well. She added, “Growth is uneven across the state, and that the St. George area attracts many retirees and “snowbirds,” and that immigration exceeds the “natural growth” of more births than deaths. 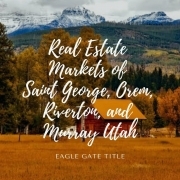 Real estate markets of Saint George, Orem, Riverton, and Murray should continue an upward swing.